Breast cytopathology, also breast cytology, is a relatively small part of cytopathology, as core biopsies are more in style. This article deals only with breast cytopathology. An introduction to cytopathology is in the cytopathology article. FNA done for a clinically benign lesion - unusual to find malignancy. 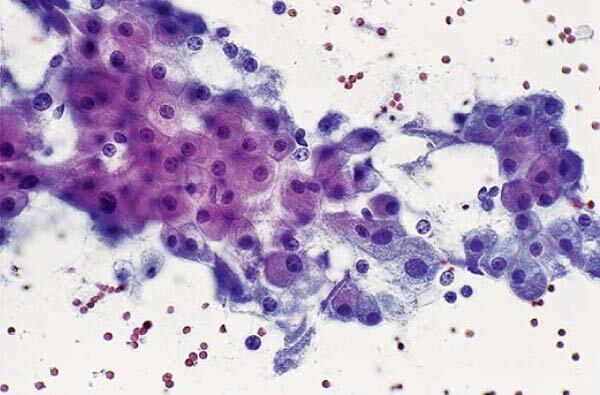 FNA of a satellite lesion to assess extent of a presumed cancer; done together with a core biopsy of another site. Lobular carcinoma - often single cells (may be in "chains"/"single file"), slightly hypercellular, cells appear bland/normal cytologically (if not carefully examined). If the cells are not dissociated... cancer is not likely. If there are stripped bipolar nuclei (these represent normal stromal cell) - cannot call overt malignancy. Adipose tissue may represent a lipoma. Fibroepithelial lesion (fibroadenoma, phyllodes) Clusters of cells with staghorn shape (jagged edge), bare bipolar nuclei Flat sheets & fluffy paucicellular (fibrous) tissue Mixed pop. in cluster; nuclei: oval/spindle (myoepi.) and round (epi.). Ductal carcinoma Nuclear atypia, lack of stripped bipolar nuclei 3-D clusters Nuclear size variation, membrane irreg., nucleoli (prominent) - every cell, cell size var. Light pink "low density" whispy poorly demarcated blobs - lack a nucleus. Early: cellular outlines seen, light pink/loose cytoplasm. Mid: cellular outlines indistinct, dense pink cytoplasm. Foamy macrophages - adjacent to fat. Abundant cytoplasm with granular (pink) crap inside. Oval nucleus with small nucleolus. +/-Myospherulosis - granulomatous reaction of fat & blood. Round aggregate of RBCs ~10-20 RBCs in diameter. Healthy adipocytes - large cells, clear cytoplasm. Myospherulosis - due to exposure to fat, may be seen in the context of malignancy. Late fat necrosis - calcifications (ajronline.org). By convention one usually calls everything ductal carcinoma. It is the same as mammary carcinoma. May be marked adjacent cells different by factor of 2. Typically not marked - often ~1.5. Should be in every cell. Lack of singular bipolar nuclei (in the background), key negative. 3-D clusters - strong indicator. Cytoplasmic vacuoles - considered a classic finding. Exceptions are tubular carcinoma and colloid carcinoma; these have cells found in clusters or tubules/glands. Intracytoplasmic "lumens"/inclusions (think lobular carcinoma). A useful rule of thumb: strongly suggestive of malignant ~3x RBC diameter & dyscohesive. Targetoid mucin - key features. Tubular structure with sharp point - key feature. Mucin - blue/gray acellular material. Pitfall #1 for a malignant diagnosis, i.e. ductal carcinoma. Cells with round nuclei (epithelium). Cells with oval nuclei (myoepithelium). Fluffy appearance - relatively paucicellular. Represent myoepithelial cells stripped of their cytoplasm. Nuclei typically ovoid, may be spindle-shaped. Architecture - pretty much anything (flat, single, papillary, clusters, sheets). Finely granular cytoplasm - key feature. Nuclei round typically with one nucleolus (occasionally several nucleoli). Macrophages (foamy) - key feature. Vacuolated cytoplasm + round/oval nuclei. Malignant cell may have "cell-in-cell" arrangement. Fibrovascular core - may not be evident. Fibroadenoma - has single cells without cytoplasm. Myoepithelial cells (bipolar cells) - important. ↑ 1.0 1.1 Lefkowitch, Jay H. (2006). Anatomic Pathology Board Review (1st ed.). Saunders. pp. 678. ISBN 978-1416025887. ↑ SM. 12 January 2010. ↑ SB. 27 January 2010. ↑ 4.0 4.1 Taboada, JL. ; Stephens, TW. ; Krishnamurthy, S.; Brandt, KR. ; Whitman, GJ. (Mar 2009). "The many faces of fat necrosis in the breast.". AJR Am J Roentgenol 192 (3): 815-25. doi:10.2214/AJR.08.1250. PMID 19234281. ↑ Chau, KY.; Pretorius, JM. ; Stewart, AW. (Oct 2000). "Myospherulosis in renal cell carcinoma.". Arch Pathol Lab Med 124 (10): 1476-9. doi:10.1043/0003-9985(2000)1241476:MIRCC2.0.CO;2. PMID 11035579. ↑ Sidawy, Mark K.; Ali, Syed Z. (2007). Fine Needle Aspiration Cytology: A Volume in Foundations in Diagnostic Pathology (1st ed.). Churchill Livingstone. pp. 137. ISBN 978-0443067310. ↑ Lefkowitch, Jay H. (2006). Anatomic Pathology Board Review (1st ed.). Saunders. pp. 678 (Q16). ISBN 978-1416025887. ↑ Chan, S. 26 April 2012. ↑ Lefkowitch, Jay H. (2006). Anatomic Pathology Board Review (1st ed.). Saunders. pp. 676. ISBN 978-1416025887. ↑ 10.0 10.1 Lefkowitch, Jay H. (2006). Anatomic Pathology Board Review (1st ed.). Saunders. pp. 677. ISBN 978-1416025887. ↑ URL: http://moon.ouhsc.edu/kfung/jty1/CytoLearn/CytoQuiz/CQ-021-040/CQ-035-M.htm. Accessed on: 9 April 2012. ↑ URL: http://www.womenshealthsection.com/content/print.php3?title=gynpc004&cat=60&lng=english. Accessed on: 31 March 2012. This page was last modified on 25 December 2014, at 20:22.